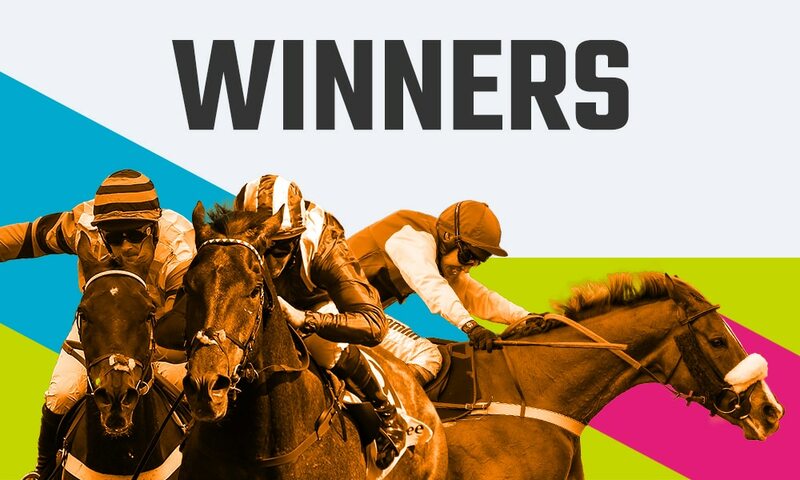 Solo punter takes on Punchestown pool and wins £12,670! Sunday’s £20,000 Win 6 at Punchestown was won by 1.60 units, including the below story of a punter who played a £12 ticket into the pool just minutes prior to the off at 12:40 (GMT). The 11/4 favourite in the first (Young Paddymc) was the first of four banker selections (single selections in a leg) over the course of their ticket, and it was a comfortable first leg for the punter, winning by 7 lengths. They ignored A Plus Tard (5/4 favourite) in leg 2, hoping instead that Winter Escape (12/1) or Ben Dundee (6/1) would succeed. Winter Escape overtook A Plus Tard as they approached the final fence and held on to send the punter into leg 3. Another favourite (Peacocks Secret) did the business for them in leg 3, before a brilliant ride from Eoin Mahon who steered Se Mo Laoch to victory in leg 4. At this point just 15.9 units (from a total of 4,418) remained in the hunt for the prize. Leg 5 was the feature race of the day. The Moscow Flyer has a prestigious roll of honour, with Getabird, Douvan and Faugheen helping trainer Willie Mullins win the Grade 2 event four times in the past 5 years. However, despite saddling two of the six runners, it was rival Gordon Elliot who claimed the prize with Felix Desjy. Sean Flanagan was allowed an easy lead throughout, and put his rivals to the sword turning for home, eventually coming home 5 lengths in front of the Jessie Harrington-trained Jetez. On to the final leg then, and just 3.2 units left including our friend who was over the last fence with the finishing line in sight. Relying on the favourite, would they now consider a Cash Out? Apparently not. They let the ticket ride and will have been elated to watch Vision D’Honneur run home in first. Congratulations and huge respect for holding their nerve, passing up on Cash Out offers as their £12 ticket went the distance to secure £12,670! Last week’s 1X2 Pick 8 Rollover prize got to £68,153 by the time it kicked off with Tottenham’s Carabao Cup semi-final first leg against Chelsea. 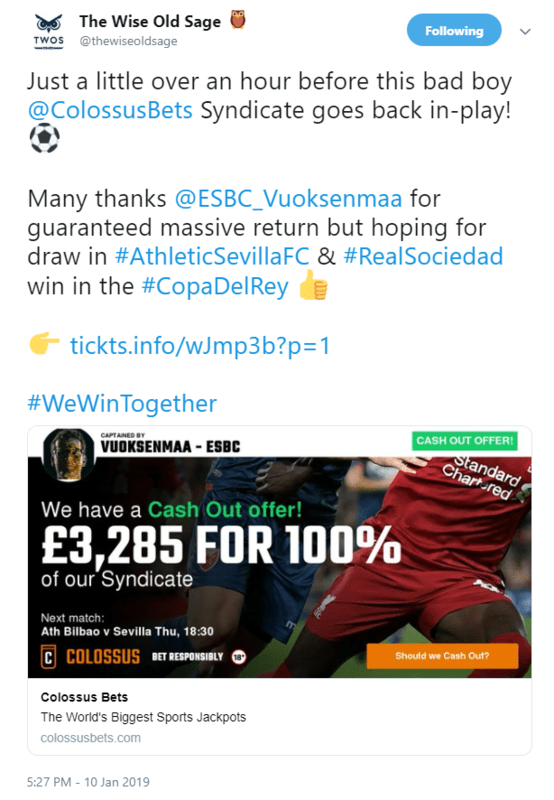 Vuoksenmaa’s €108 ticket (which attracted 8 other contributors) was playing for a possible €17,038 comfortably progressed through Tuesday’s 2 legs as Spurs saw off a toothless Chelsea whilst over in Spain, Sporting Gijon beat Valencia thanks to a winner from Nick Blackman – an Englishman on loan from Derby County. The first of Wednesday’s games was Monaco’s Coupe de la Ligue match against Rennes which ended in a draw after 90 minutes. Astonishingly, it required both goalkeepers to take part in the penalty shootout as Monaco eventually progressed to the semi-finals. Crucially, in Wednesday’s last leg where the Syndicate had Getafe as a banker selection against Valladolid, Angel Luis Rodriguez scored an injury time winner for Getafe to help ensure a win for the Syndicate as the Captain had covered every selection in the final 2 legs! Units still live for the win in the Rollover had now dwindled from a starting total of 45,860 to just 43.1. Unfortunately the most ideal results for the Syndicate – those which would have resulted in the fewest winning units and thus a larger prize for winners – didn’t materialise. 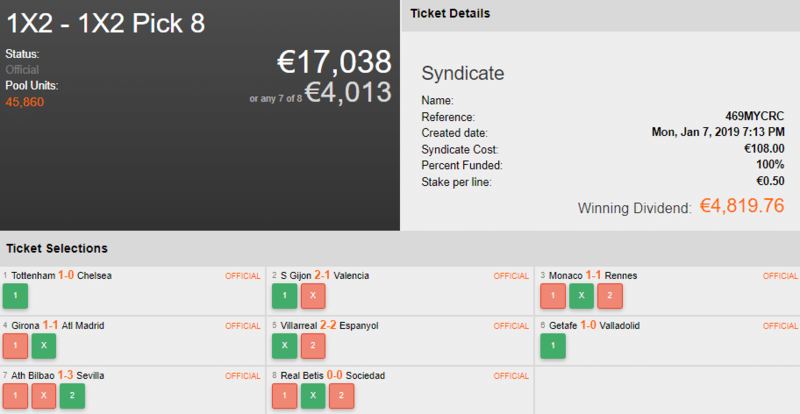 Sevilla won away at Athletic Bilbao while Real Betis and Real Sociedad drew, leaving 3.91 winning units in the Rollover including Vuoksenmaa’s Syndicate! The €108 ticket returned a healthy €4,819!